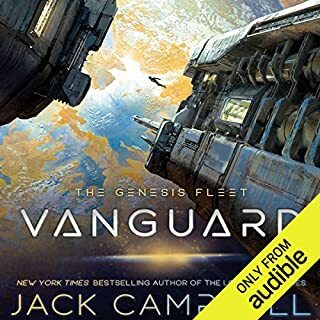 A young fleet officer and a marine stand together to defend their colony in the continuation of the powerful and action-packed Genesis Fleet saga from New York Times best-selling author Jack Campbell. 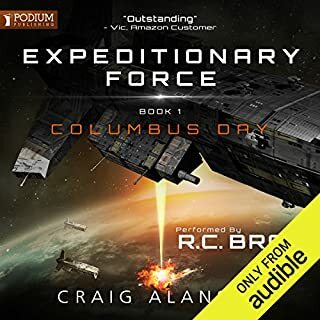 ©2018 John G. Hemry (P)2018 Audible, Inc. I look at this series as something to add depth and color to the main Lost Fleet series. While I will buy the next of course, I really want another Blackjack book. Tension from beginning to end. I sometimes had to concentrate to remember which of the numerous cast was which, and the audio narration never paused to indicate changes in location or point of view. Being familiar with most of the characters from book one helped, and I thoroughly enjoyed accompanying them through their new perils. This is book two of the Genesis Fleet Series. It is a prequel to the Lost Fleet Series. Campbell is a master storyteller. The book is well written and has the most interesting characters. The book contains lots of action and a great space battle. 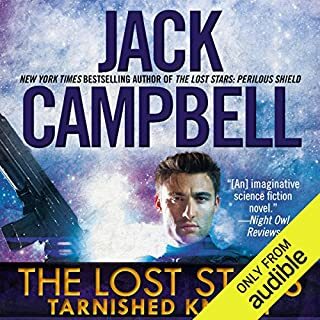 I have become a big fan of Campbell and cannot wait for his next book. The book is ten hours. Christian Rummel does any excellent job narrating the series. Rummel is an actor and voice-over artist as well as an award-winning audiobook narrator. Enjoyed the trip and journey this book takes you on. Fast pace and ties seamlessly in the story line from the first book. The only problem I have with this book is the wait! I had to wait for it to come out, and now I have to wait for the next one. Granted, you know the characters are ultimately going to be successful; but that's not the point! These are the stories of how they got there! This is how you write a prequel! 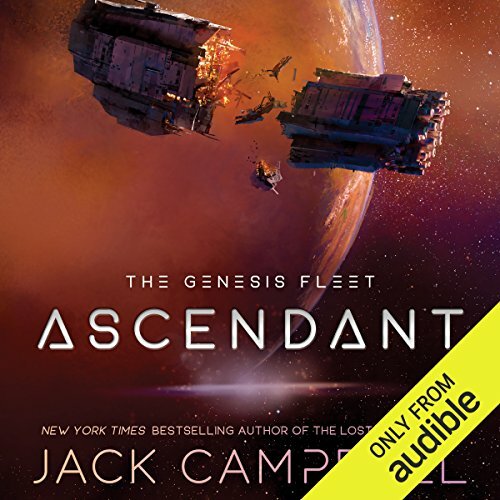 Thoroughly enjoyed this audio book! So will you! The saga continues and the characters come alive in this second installment of the series. 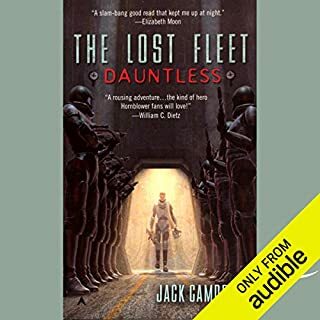 Having listened to or read the lost fleet series, I felt right at home with the story and the universe where it takes place. i have yet to not be suprised at every J Campbell book. This book is like a fast paced all out run from start to finish. The only problem i have with this book is at the end of my commute home each day i find myself sitting in the driveway another hour until i have to hit pause and pull myself away, but since there is no pause in the action it is always difficult. Now I only have to add that I hope Mr. Hemry is typing as fast as he can as i now feel like an addict having to go cold turkey till my dealer in words can resupply me again. 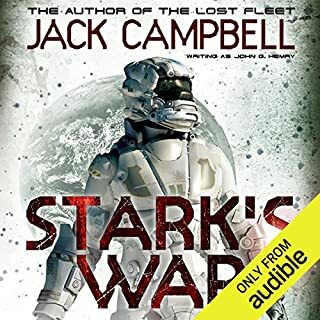 I could listen to this without knowing the author or character names and would know it was by Jack Campbell. That's a good thing, because the book has all the features of his books that I like. It could have been longer and the sequel will not appear soon enough. This is a good continuation of the saga of the Alliance's formation (as well as the Syndicate I expect). Christian Rummel does a good job of reading and voices as usual. So Mr. Campbell, tell me what you really think about checklists. I am so ready for book three. I see the handwriting already New Colony Alliance Fleet. This second book builds well on the foundation laid in the first. Having read or listened to all the lost fleet books it is great to see how the “ancestors” founded the Alliance. The audio production is well performed, with similarities of character (eg Lee Cadagan being similar to Victoria Ramone) being shown by voice and accent. Well done one and all. How long till the next one? 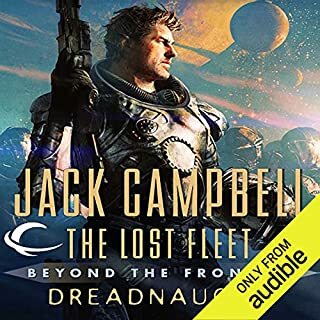 As a prequel to the Lost Fleet series this works well but it can also be treated as a stand alone series. Only two in this series far hopefully more to follow. I enjoy John Henry's books. Having started with the lost fleet and Tarnished Knight, it feels good to be back in that universe again. It feels like the books and narration have grown up a bit with a lot more flow to them. It's also great to see the marines' action too. Something that was only touched on in the older books. Really looking forward to the next ones. Thank you Mr Henry for the book and once again well read by Christian Rummel. Once again, this is looking to be a great soap opera with good narration and I look forward to the next instalment, hopefully not too long coming.